PHUKET (PATONG): Scores of publicans running beer bars at the Sukhumvit Road night entertainment complex on Rat-U-Thit 200 Pi Rd were locked out of their businesses on Thursday afternoon for refusing to sign new rental agreements with Moodies Entertainment, which has reclaimed the right to operate the complex. Kathu Police Inspector Sophon Borrirak told the Gazette that he received a report from Moodies on Thursday, saying the action was taken because many publicans operating beer bars in the two-story complex were in breach of contract. According to Lt Col Sophon, Moodies representatives told police that they had rented out the complex to a third party who subdivided it into beer bars and established rental contracts with their proprietors. According to Moodies, the third party stopped paying the agreed rental fee, so Moodies wanted the tenants to sign new rental agreements directly with the firm. However, the tenants – many of them with financial support from foreigners – refused to do so. They already had legally binding contracts with the third party, they claimed. Moodies said they are preparing to take legal against the third party, Sophon said. According to one source, Moodies employed “thugs” to come in and board up the front of the complex with corrugated panels early Thursday afternoon. There was fighting among Moodies’ people and the tenants when they were denied entry and access to their belongings, the source said. The Gazette has been unable to contact Chris Koppers, General Manager of Moodies, who opened Soi Moodies about ten years ago with a Horror House at the back. Soi Moodies was later redeveloped as a beer bar complex with the Night Station disco at its rear under a sub-lease agreement by businessman Wattana Meetam of Sukhumvit Road Entertainment Co Ltd. Night Station closed down over a year ago. 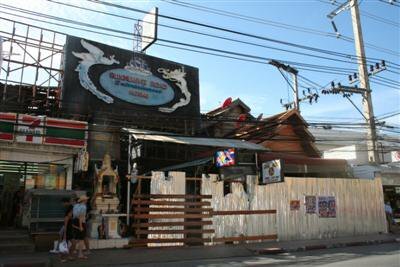 Before moving to Phuket, Mr Meetam ran the Sukhumvit Square Night Entertainment Area on Soi 10 of Bangkok’s Sukhumvit Rd. That complex was bulldozed in a pre-dawn raid carried out by paramilitary thugs on January 24, 2003, causing many investors – including many foreigners – to run into financial ruin. The Gazette has also been unable to contact Mr Meetam, who remains well-regarded by the bar owners. The bar owners are confused about their legal rights and lament the fact that they are being blocked from their pubs at a time when business had just started to pick up again after the closure of the two airports in Bangkok. Several have contacted the Phuket Gazette to complain about lack of fairness.